ESPN introduced an interesting gambling column (Insider required) -- wonder how the NFL feels about THAT since it reportedly didn't like ESPN's involvement in a concussion documentary -- and toward the bottom there is a feature about the NFL players who influence the betting line in Vegas the most. The explanation: I call the metric that is the foundation for the Millman Rankings Point Spread Value Above Replacement (PSVAR), which I calculate with help from my hard-working betting buddy Evan Abrams. It's an easy premise to follow: elite players in the league have a value when it comes to the point spread. Some are worth 10 points (the top QBs), some are worth two points (think shutdown cornerbacks). And their PSVAR is calculated by not just their value to the team, but by how much more valuable they are than the guy playing behind them. It reinforces just how much QBs are king. The top 21 players in terms of PSVAR are all quarterbacks, led by Aaron Rodgers of the Packers who comes in with a 10. 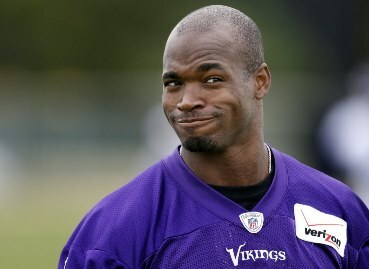 Adrian Peterson? He's in a three-way tie with Ray Rice and Calvin Johnson -- the first three non-QBs -- but their number is just 3. Jared Allen is also listed, at 2.5. This is the NFL in 2013, at least according to Vegas. Christian Ponder, by the way? Not listed in the top 100 of PSVAR, which tops out with players being given a "1." In fairness, part of the calculation is based on the player's backup, and presumably there is not much difference between Ponder and Cassel. Wednesday (The perils of 'backup QB' syndrome) edition: Wha' Happened?